With its combination of ease of use, portability and great speeds (thanks to its use of a 7200rpm hard drive), the portable drive is a no-brainer choice for anyone who is “risk adverse” when it comes to their data. 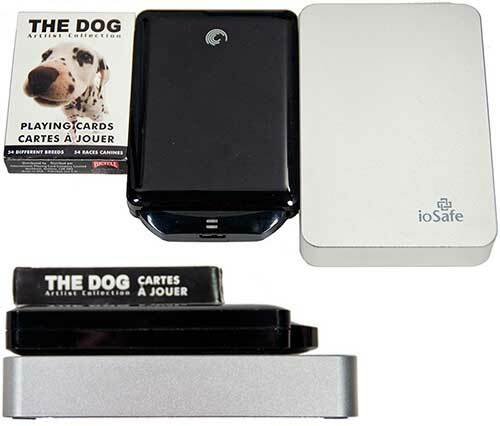 The all new ioSafe Rugged Portable is a much more compact device in contrast to the SoloPro. Whereas SoloPro is meant to be tethered to a desktop PC, the Rugged Portable is designed for notebooks in mind. Still, when compared against more typical 2.5″ HDD based devices – such as the Seagate GoFlex Ultra Portable, WD My Passport Essential and others – the ioSafe Rugged Portable is a tad on the big and heavy side of the spectrum. 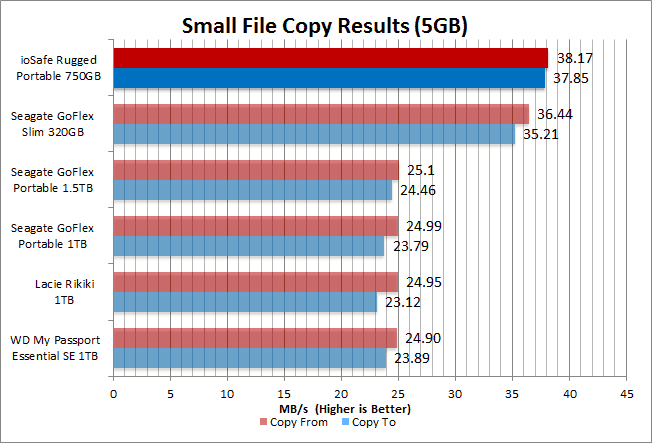 To be precise, with dimensions of 5.7″ x 3.9″ x 1.0″ and weighing in at 1 lb., the drive is a very robust portable device. The reason for its over-sized and unusually heavy weight is the fact that when ioSafe says Rugged they really mean Rugged. This well-engineered drive is not only meant to be used in harsh conditions, it has been tested and certified to do so. In fact, it meets numerous Military Specifications and is water resistant (water “proof” to ten foot for 3 days) and also shock resistant (able to survive ten foot drives). The aluminum version is also crush resistant to 2500 lbs. and there is also a heavier Titanium clad version good for 5000 lbs. While the Rugged Portable may be extremely durable and a tad large, its dimensions and weight are not a detriment to its intended niche. With its graceful, curvaceous all metal exterior the Rugged Portable, it certainly easy on the eyes. It really does look like something LaCie or even Apple would produce. The only real caveat to the Rugged Portable’s naked aluminum chassis is the fact that it is a touch slippery. If your hands are wet, there is a good chance that it will slip from your grasp. Of course, where this device is able to shrug off ten foot drops with not risk to your data, this is not all that concerning. If you find it too slippery to have absolute confidence in, there are numerous aftermarket high friction tape like solutions you can employ to negate this issue. 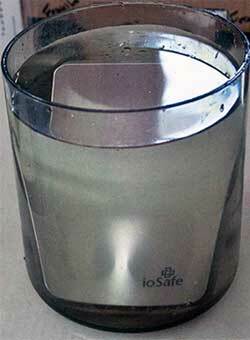 The ioSafe Rugged Portable went through three different durability tests: water immersion; fire; and blunt force. For this water immersion test, the drive was simply unplugged it and submerged in water for three days. After three days of liquid immersion, it was then then allowed to dry out before being connected to a system. 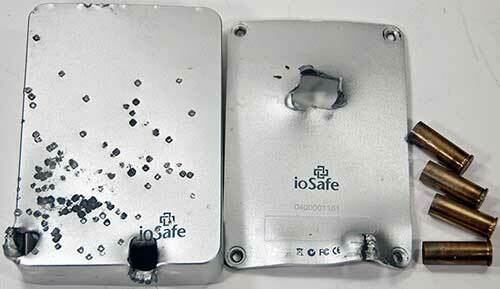 After its prolonged dunk, the ioSafe Rugged Portable seemed no worse for the wear. The USB 3.0 port was wet, so before plugging it in I did dry it out before use by the simple expedient of placing it in a bowl of rice for 24hours. After this, I simply plugged in its USB 3.0 cable and plugged it into our testbed. It fired up as if nothing had happened. This alone makes this device more durable than the SoloPro which died from a similar test. Testing Rugged Portable’s fireproof capability is a bit more complicated. The most likely fire scenario the typical user will encounter is a house or other wood based fire. To re-create this type of disaster in a more controlled manner I will be using a wood stove and roaring consisting of a mix of different hard & soft woods (birch, spruce, ironwood). To start the fire a big chunk of naphthalene based “fire starter” and a good dose of lighter fluid was used. The rugged portable was first placed in the stove and the fire was then built up around. I allowed the fire to burn for 4 hours (with wood being added as needed) before removing the Rugged Portable and allowing it to cool. This combination of chemical and wood fire should recreate fairly well what would happen to your data if you are unlucky enough to ever experience a house fire. After being toasted like a marshmallow and then allowed to cool, I then simply blew out the USB 3.0 port with some compressed air and plugged it in. Once again, it started up as if nothing untoward had happened. It may have looked a little worse for the wear as the plastic feet had melted off, but the hard drive housed within it certainly wasn’t phased by this rough treatment. Please note: This drive is technically not fireproof. ioSafe makes no claims that it is. 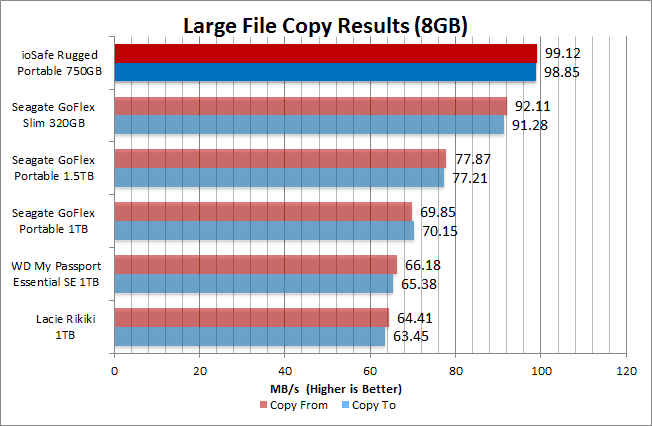 This test is just to compare this version to the bigger SoloPRO and is for information purposes only. Neither Everything USB nor ioSafe will take any reasonability for loss of data, warranty or life. Lastly, while highly unscientific – yet so enjoyable – I have devised one last test for the ioSafe Rugged Portable: blunt force trauma. What better way to test for shock protecting than with high powered firearms! To this end, two 12 gauge 3 inch magnum buck shot rounds were expended from a range of 7 yards. It seems that while the chassis of the Rugged Portable is pretty tough, the exposed USB 3.0 port isn’t as tough. 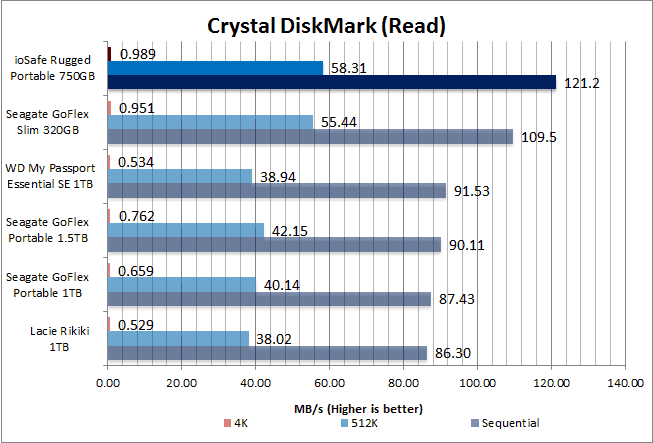 The second load of buck shot hit just about perfect to take out the USB 3.0 port rendering the device unusable. However, when the internal hard drive was removed, it was perfectly fine and powered up as if nothing bad had happened. Since the ioSafe was already dead at this point, I wanted to see exactly how tough the chassis was (after all it did shrug off buck shot.). Four shots of truncated, jacketed 44 magnum rounds later and I had our answer: pretty tough. Sure the drive would have been dead, but the rounds could not penetrate both sides. That’s one tough case. One key area where the ioSafe Rugged Portable differs radically from the SoloPro line is in the software. This is for the simple reason it actually comes with a fairly decent software package. While the software does not come preloaded on the device itself all you need do in order to get your copy of Genie Timeline is register your product. Once you have registered your drive, you are given a serial number and URL for downloading. It is a fairly large download, but unless you only have a dial-up connection this additional step is more than worth it. As a bonus, you know you will be getting the most up to date version as more often than not the version which come preloaded on most device is months out of date. The software’s UI is deceptively simple. On first blush, it appears to be too simple to be taken seriously. However, while it is extremely easy to use, it still has all the advanced features you will need. 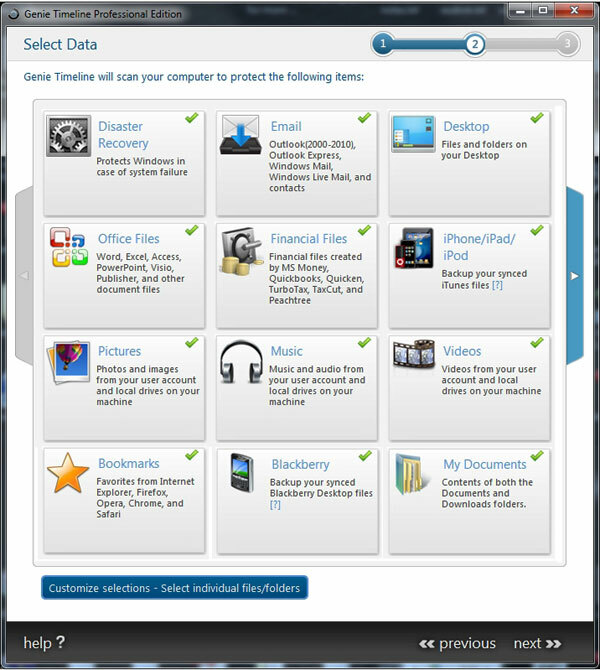 These features include 256 bit encryption (software based) and the ability to be able to choose backup files by type. This means if you just want to backup say all your photos it is as easy and clicking that option. To put it bluntly, this is a very decent, and robust backup and restore software program that even novice computer users should have no troubles navigating. It seems that no matter what size the test files are, the ioSafe Rugged Portable 750GB drive is simply faster than anything else (in its class) I have reviewed. 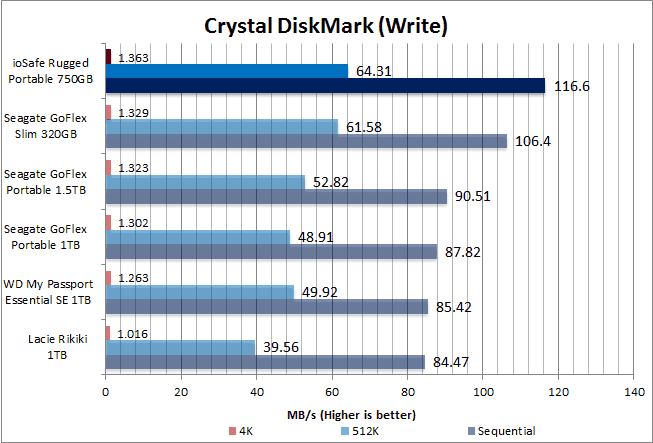 It’s evident that not even the ultra fast Seagate GoFlex Slim is not able to match the Rugged Portable’s performance, thanks to the 7200-rpm Seagate Momentus 2.5″ drive. As with the synthetic test results, the real world results show that you need not worry about the performance aspect of the Rugged Portable. Your data is not only perfectly safe, it is also going to be quick in getting to and from the Rugged Portable. This drive really is a triple threat. It offers great performance, great protection and has great aesthetics. While it is unfortunate the Rugged Portable itself could not survive all the tests, the hard drive itself did. This means that no matter how extreme a situation you encounter your precious data is going to be as safe as it could possibly be. Even in a worst case scenario (you just survived a flood, a fire and a sudden drop) your data will be safe and sound; or at the very least have a much better chance of surviving the disaster than you will. As long as you are willing to pay more per gigabyte than you would for an unprotected portable drive; and as long as you don’t mind it being slightly less portable than an unprotected drive, the ioSafe Rugged Portable would be a great choice.